Russia rolled out its first upgraded Tupolev Tu-160M2 long-range supersonic strategic bomber at the S.P. Grobunov assembly facility in Kazan, in southwest Russia, on November 16, according to Russian aerospace and defense company Tupolev. The roll-out took place in the presence of the commander of Long-Range Aviation of the Russian Aerospace Force, Lieutenant General Sergey Kobylash, next to a host of high-ranking defense industry officials. The Tu-160M2 is expected to make its debut flight in February 2018, the Tupolev press statement notes. The date of the aircraft’s maiden flight was confirmed by Deputy Russian Prime Minister Dmitry Rogozin on November 16. “We plan that the aircraft will be built already in 2019. 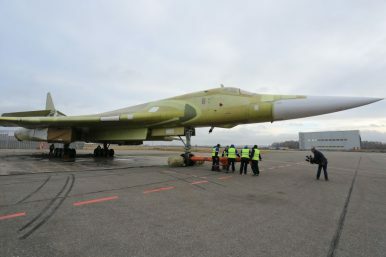 Serial deliveries should begin in 2023 while we plan to carry out the first flight of the Tu-160M2, which has been rolled out of the workshop today, in February next year,” Rogozin said. The new Tu-160M2 will be an upgraded variant of the world’s largest supersonic strategic bomber, the Tu-160 (NATO codename “Blackjack”). However, according to the Russian Aerospace Force, the Tu-160M2 will be a completely new bomber aside from the airframe. The Tu-160 took to the skies for the first time in December 1981 and first entered service with the Soviet Air Force in 1987. Till today, it remains the airborne component of Russia’s strategic nuclear triad, although only about half of the Russian Aerospace Force’s 16 Tu-160s are purportedly operational. Three Tu-160s have so far been upgraded to the Tu-160M variant, according to Jane’s Defense Weekly. Both the M and M-2 variants of the aircraft are fitted with new avionics, sensors, displays, communications systems, and operating software. “The only comparable difference between the M and M2 standard is the new Kuznetsov NK-32-2 turbofans,” Jane’s reports. The Russian aircraft industry began testing a non-afterburning variant of the Kuznetsov NK-32 engine, purportedly the largest and most powerful turbofan jet engine ever fitted on a bomber, in October. “NK-32 series 2 has improved performance, and its range of flight will be increased by at least 1,000 km, compared with existing engines,” Russian Deputy Defense Minister Yuriy Borisov announced in 2015. The new engine would give the M-2 variant increased range and maneuverability, but Russia could retain older engines due to funding problems. Russian President Vladimir Putin ordered the upgrade of Russia’s Tu-160 force due to delays in the next-generation strategic stealth bomber project, dubbed PAK DA (an acronym for “Prospective Aviation Complex for Long-Range Aviation”), although in a statement last week, Putin emphasized that he did so following a recommendation by the Russian Ministry of Defense. “It was the Russian Defense Ministry that insisted on resuming the production of the upgraded Tu-160 aircraft, which had proven its worth as a supersonic bomber,” he said. The Russian Aerospace Force intends to procure at least 50 new Tu-160M2s at a rate of three aircraft per year beginning in 2023. The aircraft will likely be armed with long-range standoff cruise missiles including the Kh-101/Kh-102 (nuclear variant) air-launched cruise missile.